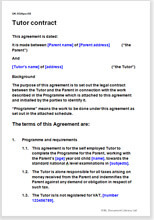 A simple contract for self employed children’s tutor to present to parents for agreement and signature. Flexible for you to decide first what terms you want, then to present to parents and negotiate anything they are not happy with. Covers many areas where disputes could arise: expenses, prompt payment, emergency procedures, parental absence, hours of work and more. Most importantly, it provides the simplest way to deal with the Consumer Contracts (Information, Cancellation and Additional Charges) Regulations 2013. As a worker at home, with other people’s children, you need protection. If you have not arranged for up front payment you are always at risk that your client will not pay. We give you the option of alternative payment procedures. The document provides strong provisions on mutual confidentiality (particularly to make parents responsible for what may be posted on a social network.) Limitation of liability also features large in this contract. The basic contract, tutorial work to be done, exam targets, if any. "First class . Written in accessible English - consistently to "you" and rendered down to the true essentials. Saved a great deal of time!"